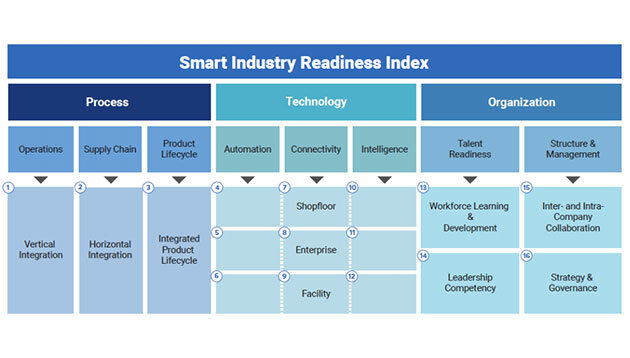 The Singapore Smart Industry Readiness Index, a world-first tool, has been launched to help industrial companies harness the potential of Industry 4.0. According to as press statement, the Singapore Economic Development Board (EDB) has partnered with global testing, inspection, certification and training company TÜV SÜD to launch the Index on 13 November. The index is described as a diagnostic tool that companies of all sizes and industries can utilise to better understand Industry 4.0 concepts, evaluate their facilities, and design a comprehensive transformation roadmap for their businesses. “Many companies often put technology first. With this Index, we put people and processes alongside technology, so that companies can maximise the potential of Industry 4.0,” he added. The Index is based on three fundamental building blocks of Industry 4.0: process, technology and organisation, which is then divided into eight pillars of focus. The eight pillars are further broken down into 16 dimensions of assessment, each providing an assessment matrix which companies can use to evaluate their processes, systems and structures. Intended as a step-by-step improvement guide, the dimensions within the Index gives companies intermediate steps needed for them to progress.